the theme was "tweens" so i designed a book with pockets that a young teenage girl might like for holding pictures and notes from her friends. i used texting acronyms for themes on each page, like "omg" and "bff." ya just gotta love these little blank board blocks - they're so versatile. make this charm necklace for someone special. click here for my project instructions....and as my friend glenna says, "everything is better with glitter!" click here for project instructions for this greeting card i made with Fantastiques. 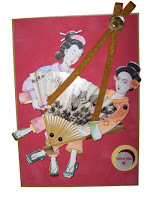 two geisha girls sitting in a fan swing, and their arms and legs swing too!